Our days in Vienna were amazing. We went to a concert at Musikverein, a concert hall built in the 1800s that has incredible acoustics. It’s just beautiful architecture as well. Then we went on the hop on hop off bus to Schonbrunn , which was the summer palace of the Habsburg of the Austrian Hungarian empire. It was beautiful and really interesting history. There is another palace across town called Hofburg Which is where the Lippizana horses and the Spanish riding school is also located. This was a fabulous place and full of little shops behind The palace grounds and stables. 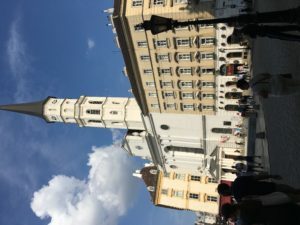 Vienna is just rich in culture, history and a very cool place.